Happy Friday. Hope you are hungry. 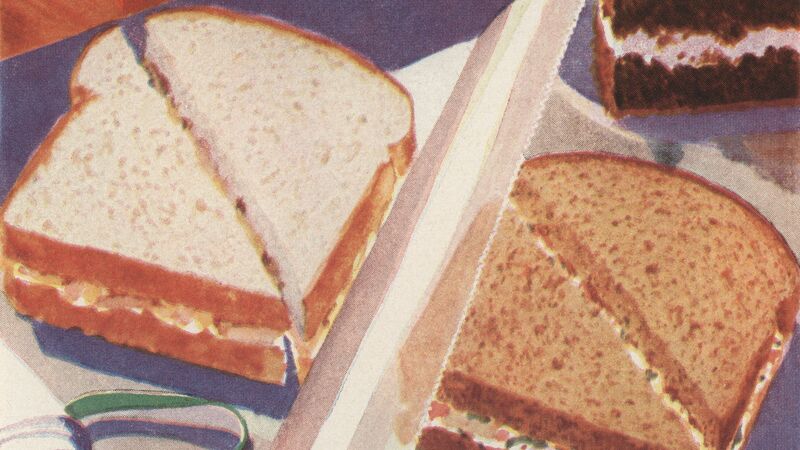 The latest craze in Silicon Valley’s effort to turn every basic human need into a subscription service is MealPal, which lets urban workers pre-order lunch for about $6, typically a $2–$3 savings. The bottom line: MealPal, based in New York, is far from the first startup to try to improve the lunch experience, notes Axios' Kia Kokalitcheva. There are apps like Allset, which allows participants to skip the line at restaurants along with a range of different digital loyalty services. But according to MealPal co-founder and CEO Mary Biggins, who previously helped start fitness class subscription company ClassPass, her company’s winning combination is that it makes lunch more convenient for customers and also saves them money. How it works: Every day, participating restaurants select a meal to be for the app’s customers. More than 90% of those meals are already available on the restaurants’ regular menu, though some do prepare a special portion or item for MealPal users. Customers purchase monthly meal subscription plans, which vary slightly per city, and choose which restaurants to visit each day to get their lunch. For restaurants, this is an efficient way to prepare a large number of meals quickly and easily as they receive the day’s orders in the morning, Biggins says. MealPal already has 4,000 restaurants across 16 cities in the U.S., Europe and Asia, and only 7% of restaurants who have tried the service have left, according to Biggins. The company has also been able to keep its marketing spend minimal — more than 80% of its customers heard about the service via a friend or coworker. What’s next: MealPal, which raised $35 million in funding since its 2016 founding, is quietly working on ways to let entrepreneurs sell lunches via its service without needing all the expensive trappings of a conventional restaurant, like a store front. Biggins wouldn’t share more details about how that would work but did say that meals will be for pickup, not delivery. Our thought bubble: It's unclear just how long MealPlan's appeal will last or whether it will broadly scale. It's part of a class of startup ideas that my old boss, Kara Swisher, has dubbed "assisted living for millennials." 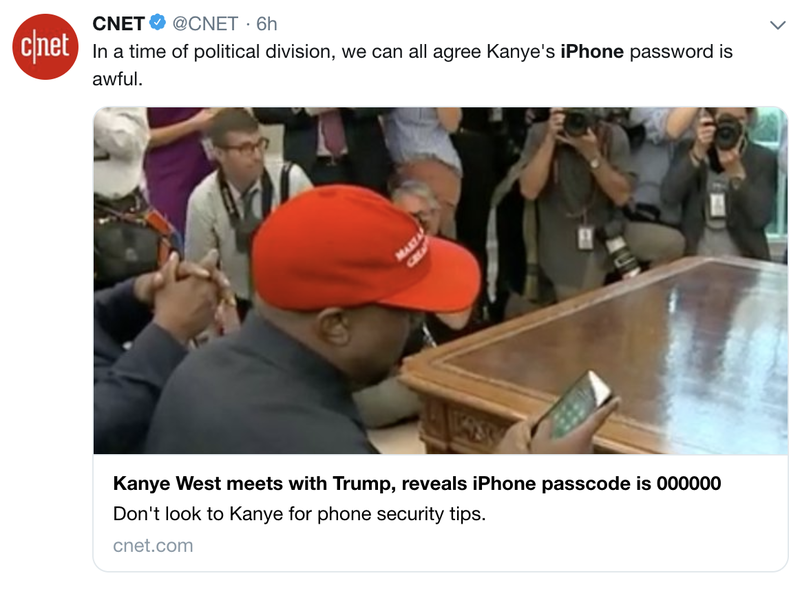 While some had larger issues with Kanye West meeting with the president in the Oval Office on Thursday, many techies were hung up on the fact West revealed his iPhone passcode — and it's a weak one. Video from the White House meeting shows West pressing a bunch of zeroes to unlock his phone, a bad practice that some suggest indicates that perhaps West's other online accounts might also be easily hacked. Why it matters: Celebrities are even more likely to be victims of targeted attacks, making the need for strong passwords even higher. What they're saying: Besides CNET's tweet shown above, several others had something to say. Deray Mckesson: "Whoever if friends with Kanye, please tell him to change his cell phone password ASAP." BlackBerry: "In our opinion there's no place for weak passwords in any office. The solution? 'adaptive authentication,' which would leverage AI and ML to create a unique digital identity." Meanwhile, West also suggested to President Trump that he have Apple build a hydrogen-powered replacement for Air Force One. His proposed design turned out to be a Detroit student's graduate thesis. Uber sent a letter to federal securities regulators yesterday, asking for rule changes that would let it provide company stock to its drivers, Axios' Dan Primack reports. Uber first met with U.S. Securities and Exchange officials several years ago about this issue, but was rebuffed. New SEC chairman Jay Clayton, however, spearheaded a request for comment on the issue, and Airbnb received attention last month for its positive response. Why it matters: This could become an important new type of compensation for millions of "gig economy" workers. The U.S. share of global venture capital investment has fallen as European and Asian growth in the sector far outstripped American increases, according to a new report from the Center for American Entrepreneurship. [T]he world’s high-tech entrepreneurs are able to stay in their home city or nation and raise venture capital — a pattern that may accelerate if the U.S. government fails to create an entrepreneur visa or attempts to limit the immigration of highly-skilled individuals. As late as the mid-1990s, the U.S. was home to roughly 95% of all venture capital investment in the world, Axios' Marisa Fernandez reports. Today, its share has dropped to just over 50%. Investments in American startups like those in Silicon Valley, New York City and Boston reached $90 billion in 2017 — a 160% increase since 2010. But the rest of the world has collectively grown more than twice as fast — by 375%, per CAE. Countries in Europe and Asia are providing lures for people with capital in hand to do business on their turf. Fast-tracked permanent residency and five-figure relocation bonuses are among the perks some countries are offering immigrant startup founders, Bloomberg writes. "China's engagement with the rest of the world is way better than [the U.S.]," study author Ian Hathaway, CAE research director and a senior fellow at the Brookings Institution, tells Axios. Most companies are attracted to the global market and will go wherever the attitude is positive, he said. Go deeper: Marisa has more here. Bird has hired 2 former Uber executives. Dennis Cinelli will be a VP and head of finance, while Yibo Ling will serve as VP of corporate development and will lead the company's China team. Both will report to CEO Travis VanderZanden. It turns out moons can have their own moons. And they are called moonmoons.